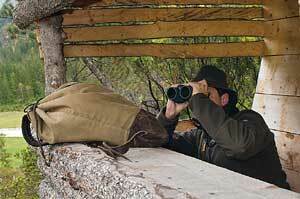 Swarovski SLC HD Binoculars — The evolution of hunting binoculars. 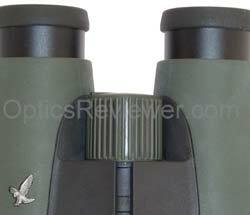 Swarovski SLC HD Binoculars - Just for Hunters? A couple of the OpticsReviewer.com team members decided to take binoculars to a nearby wooded area one autumn evening and see how they performed in the evening light. One binocular was optically very good, but not quite what one might call an "upper tier" binocular. The other was the Swarovski SLC HD 8X42. Their purpose was not so much to compare the two optics as it was to just become better acquainted with both of them. As they entered the woods, they stopped and used the binoculars to scan the area to see if any wildlife might be in evidence. They didn't see anything and so advanced a bit before scanning the area again. 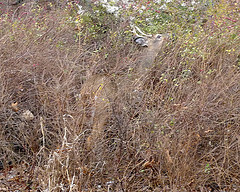 Before long they noted a young deer contentedly grazing in front of a bit of brush that still had some green leaves mixed in with the autumn brown. They admired it for a bit before one, who was using the SLC HD binocular, quietly said "There's a second one on the other side of the brush." The other hunted high and low for a sign of movement or the telltale bit of color through the brush and saw nothing. He thought it might be the low light and common brown color of the brush's branches and tried a variety of focusing methods, including focusing so the bark on a tree just the other side of the brush was well-defined, and still saw nothing. With the second fellow on the verge of disbelieving that there was a second deer, they exchanged binoculars and the image jumped out at the fellow now using the SLC HD binocular. Clearly visible with the Swarovski SLC HD was a deer leg on the other side of the brush branches - brown, but a different shade of brown than the autumn brush colors and it stood out plainly with the SLC HD's optics. They exchanged optics again and, now knowing where to look for the leg, the second fellow again tried to see it again with the other binocular and again failed. It wasn't long before the second deer came fully into view — it was a bit older than the first and both continued enjoying relaxing during an evening meal. They continued to watch the deer for several minutes before moving quietly away to allow them undisturbed peace and tranquility. For the OpticsReviewer.com team it was a pleasant opportunity for observing wildlife and an excellent opportunity to learn about the quality of the Swarovski SLC HD's optics. Swarovski SLC HD binoculars are the latest version of the SLC model to market and were introduced for 2010 in a major update/makeover for the model. Some may not realize that the SLC binoculars were originally intended as Swarovski hunting binoculars for the European market where hunting was much more popular than general wildlife observation at the time. The optics were originally designed with high optical contrast to compensate for the largely overcast skies of northern Europe and thus were not color-neutral. Although the SLC's color bias didn't bother the hunters, the birding enthusiasts of Sweden, Britain, and later the United States who found out about their excellent optics did take issue with it and news of their attitude reached Swarovski designers. The result was that a color-neutral design was produced in another model specifically for wildlife observers and other binocular users. The success of that model sent the designers back to work up a re-designed SLC that would be favorable to requirements for both hunting binoculars as well as those for birders and folks who just enjoy the outdoors and wildlife. Hunters, outdoorsmen, wildlife observers and, well, pretty much everyone else are indebted to the bird watching community for taking the initiative to push for the quality of optics we're enjoying today. It's the birding enthusiasts, you see, who have been the principal driving force behind the major improvements in optics over the past 20-25 years. They're the ones who have demanded the improvements that allow all binocular users to enjoy a brighter view, greater color fidelity, and greater contrast in the lowest light possible (without electronic enhancement!) — all of which mean more useful, observable details for the optics user. We like the simple, practical, understated appearance of this binocular model. You don't want a flashy piece of equipment, you want one that will do the job and do it well. This one does its job well and with class. In response to a good interest, but a general lack of objective reviews of the Swarovski SLC HD binoculars, we figured we should step up to the plate. We ordered an SLC HD 8X42 and both used and tested it to see what current production was like and we're sharing this review in December 2011. What do the Swarovski SLC HD binoculars provide that's out of the ordinary? To say it differently, what makes them worth the prices people happily pay for them? It's a fair question, but before we go there we need to set ourselves straight on their name. The SLC stands for "Slim, Light, Compact." Technically, the name should be Swarovski SLC W B HD with the "W" standing for a German word that means "wide-angle" and the "B" standing for a German word that means "twist-up eyecups." Sometimes people put the W and B together so it reads as "Swarovski SLC WB HD," however this isn't how the folks at Swarovski write it! While we neither owned nor reviewed the highly-rated Swarovski SLC Neu binoculars, we understand from those who have used both that the SLC HD model represents a huge jump in performance over the older ones. Onward with the "Swarovski SLC HD W B binoculars" review, then! Why is the Frame Made of Magnesium? Magnesium is a strong, but lightweight, metal that's commonly used in higher-end binoculars. In fact, magnesium is even lighter than aluminum and, when you're dealing with the heavier weight of optical-grade glass, you want to be able to reduce the weight of other components whenever possible. (Swarovski uses lightweight alloys for load-bearing component durability.) Another consideration is that good metal is much easier for an optical technician to work with in repairing your binocular if that should become necessary. To give an analogy, one of us had a shoe repairman who always greeted him warmly when he walked in the door. It didn't seem like much more than the repairman's friendly nature until one day he commented that he loved seeing the reviewer come in the door. Naturally, the reviewer was curious about what might make him any different from the other clientele and he asked about it. The repairman's response was that his shoes were a good quality that could be re-soled, re-heeled, etc, repeatedly and they were a joy for him to work on as compared to shoes that were made for a short life and disposal. (For those who wonder, the reviewer has typically been able to have his shoes re-soled/re-heeled at least ten times before they wear out!) Our optical repairman friends assure us that their perspective is much the same. The metal frame is covered with rubber armoring that make it easy to keep them within your grasp in wet and cold weather, whether you're wearing gloves or not. It will protect your precision optical instrument against minor bumps and scrapes, but we're pretty sure you wouldn't expect it to protect them if they're dropped or fell on the floor of your vehicle. While we're talking about the frame, it's a good time to talk about the balance of the Swarovski SLC HD binoculars, too. When you're using binoculars that are unbalanced and weighted to the front or back they'll produce significantly more fatigue in your wrists and arms than ones which are well balanced. While the instrument we tested weighed 28.5oz/810g, it felt lighter than that and we attributed this to the excellent balance. There are indents in the rubber armoring placed under the barrels where your thumbs will typically be placed when holding the SLC HD's in a well-balanced manner. While we've not yet gotten the habit of feeling for such indents, we did notice that when we had a comfortable grip on the binocular with an easy reach to the focus wheel, our thumbs seemed to naturally hit those indents. The Swarovski SLC HD Binoculars are Air-tight — Why? It's a good question and the short answer is that it's to keep the nitrogen inside the binoculars and air outside. Anyone who has been outside and getting a look at a buck with huge antlers or about to identify a rare life-list bird, or some other equally incredible moment, only to have the lenses inside the binocular fog up and spoil the view will assure you it's hugely annoying. An optical advance that came out of World War II was the discovery that replacing the air in a binocular's barrels with a dry gas and then sealing them would put a stop to internal fogging. This doesn't mean that the outsides of the ocular and objective lenses won't still fog up if you take them from a cool/cold area to a warmer, more humid area. Neither does it mean that the outside of the ocular lens won't fog when you put it up to your face on a cold day. It means that the potentially moisture-laden air molecules that could fog up your instrument on the inside, where you couldn't wipe it clean, won't be fogging up. It also means that the binoculars have been sealed with O-rings so they're waterproof and that will be important to you every time it rains when you're using them! 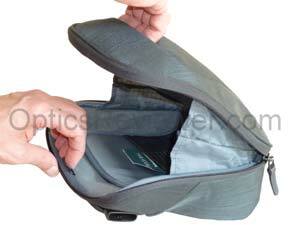 Of course, being air-tight and waterproof also means they'll keep dirt and dust out to keep your view clear for years. What about Eye Relief for Eyeglass Wearers? The Swarovski SLC HD binoculars provide good eye relief 18.5mm and 16.0mm for the 8X42 and 10X42 configurations, respectively. That should be enough for most eyeglass wearers to be able to enjoy the SLCs. The eyecups have a fully twisted-in position for eyeglass wearers, an intermediate position, and a fully twisted-out position. The intermediate step is about 6mm raised and the fully twisted-out position is about 11mm raised from the fully twisted-in position. Most of us found that we preferred the fully twisted-out position, but the intermediate position is there for a reason! Finally, you would expect the Swarovski eyecups to move up and down with smooth precision and we can assure you that they did on ours. How Friendly is the Swarovski SLC HD's Focus Adjustment? You may already be familiar with our perspective on a fast-focus adjustment versus a slow-focus adjustment. Simply put, when you're keeping up with relatively fast-paced action you don't want a slow-focus binocular! Our preference is a binocular that goes from close focus to infinity in about a full revolution of the focus wheel. According to their literature, Swarovski SLC HD binoculars are designed to provide "all the required hunting focus settings in less than half a turn" to enable you to quickly identify wildlife. We can attest to that. We found that that our SLC would go from a sharp focus at 20ft/6.1m to infinity in two thirds of a revolution of the focus wheel. The rest of the focus wheel's two full revolution potential is used to give precise fine-focus at distances under 20ft/6.1m. How's that possible? Swarovski put a new focus mechanism into the SLC HD that they say incorporates both hard and soft components. While we don't know exactly how it works, we can say it works nicely! Since we talked about it taking two thirds of a revolution to focus from 20ft/6.1m to infinity, we should mention that was simply an arbitrary distance we chose. The close focus distance specified for the Swarovski SLC HD binoculars is 6.2ft/1.8m for both the 8X42 configuration we tested and the 10x42 configuration. When we actually measured the close focus distance for the 8X42, we found it was actually 5.7ft/1.7m and well within specifications and very good for birders, entomologists, and others who look for a short close-focus distance. Before we leave the center focus discussion, we'll mention that Swarovski SLC HD binoculars have their diopter adjustment incorporated into the focus wheel mechanism. Just gently pull up on the focus wheel until it "pops" up and adjust for the difference in strength between your eyes. When finished, press the focus wheel and it will pop into place and lock the diopter adjustment against unintended adjustments. As with other Swarovski optics, the SLC HD we bought for this review prominently displayed the words "Made in Austria." Of what importance is a wide field of view? You can acquire your visual target much more quickly with a wide field of view than with a restricted field of view. You can follow action much more easily and see what you really want to see. Whether you're in the great outdoors, watching a stadium event, or trying to count cattle on a ranch you'll find a wide field of view is your friend. You'll want to read what we found about the SLC's optical sweet spot below, but binocular manufacturers sometimes cut corners in designing wide-angle optics which reduce the usable view and reduce the "effective wide-angle view." Does all this about the benefits of a wide-angle view mean you can't effectively use a narrower field of view? No, but once you've enjoyed a well-designed, quality, wide-angle optic we doubt that you'll savor opportunities to use binoculars with narrow fields of view! What's the Swarovski SLC HD's Optical Sweet Spot Like? The sweet spot of the SLC HD's view is the area in the field of view where the viewed object is in sharp focus and details are readily observed. You'll notice that some optics, sometimes irrespective of the price charged for them, will show a blurred area in the periphery of the view. The better the optics, the less blurring will be demonstrated and the more usable the entire field of view will be. We found that the Swarovski SLC HD binoculars were very sharp for about 90&percnt; of the field of view and before any blurring could be discerned, but that the image in most of that last 10&percnt; was not so blurred as to be unusable. Besides the wide field of view, the innovative focus adjustment mechanism, and so on, something that really caught our attention was the brightness and color fidelity of the view with the Swarovski SLC HD binoculars. This is because of the clarity of the optics which is due to the quality of glass used and both the type and quality of the coatings applied to the glass surfaces, so let's talk about them next. We did notice a slight chromatic aberration, or fringing of color, when observing dark wires or branches against a clear bright sky and only in the periphery of the field of view. This showed up as a small light yellow fringe above the wires/branches and a blue fringe on the underside. Again, this didn't show up in the center of the field of view, but rather only when we were getting close to the field of view's edges. Was it noticeable or obtrusive? No — it wasn't until we'd been using them a while and were intently looking for any signs of it that we noticed it. The Swarovski SLC HD binoculars' other optical qualities seem to more than make up for this! Between their color fidelity, detail resolution, and brightness, it bordered on difficult to believe that there was glass between us and our view. The wide angle certainly contributed to this, but the overall effect was simply outstanding! This is why so many people who depend on binoculars for their livelihood — biologists, professional guides, and others — choose these optics or the EL model's. They're able to be out and productive both earlier in the morning and later in the evening and it makes a difference. We found it interesting that we saw more details with the 8X42 SLC HD Swarovski binoculars than we saw with very good 10X42 binoculars with HD lenses. To say it differently, there was no advantage to 2X greater magnification in seeing details with other brands of binoculars. What would it be that enhances the details? Apart from those items which have already been discussed since they enter into color fidelity and brightness, we'd have to say that the Swarodur (to help prevent/minimize lens coating scratches) and Swaroclean coatings help with details. If you can keep the coatings from being scratched, they'll (are we overstating the obvious?) perform better. Similarly with the Swaroclean which acts to prevent water spots, dust, tree sap, insect repellent, etc, sticking to the exterior lens surfaces. Perhaps you'll be as interested as we were to learn about the lens coatings applied to the Swarovski SLC binoculars. The SLC HD's have three lenses in the objective lens area, ahead of the prisms, and five lenses make up the ocular set. When coatings are applied to binocular glass, they're applied in layers measured by thousandths and millionths of millimeters. (The average hair is 7/100ths of a millimeter.) 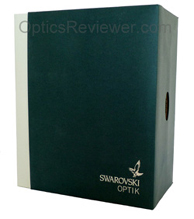 The Swarovski SLC HD has over 80 layers of coatings applied to the prisms and lenses. When testing for it, we did see pincushion distortion in the SLC HD's view. It wasn't evident in normal field use, however, and we wouldn¹t expect you to notice it in practical use. One thing that's significant is fatigue. We talked about it above as it related to a binocular's balance and causing wrist and arm fatigue. If you've ever had to use poor quality optics for long, you'll connect with us on the importance of thinking about eye fatigue. Simply stated, poor optics will cause eye fatigue and headaches and they're anything but fun. We've found that it's possible to use Swarovski SLC HD binoculars for hours without undue eye fatigue. When you need to use binoculars on a regular, ongoing basis, it's a significant consideration! When we used the Swarovski SLC HD binoculars in low enough light levels that we were unable to see feeding waterfowl at perhaps 65ft/20m distance with our unassisted eyes, we were able to see them quite clearly with the SLC HD binoculars. When viewing brightly shining parking lot lots against the dark, nighttime sky the SLC HD binoculars controlled stray light very well and we observed only a modest/reasonable amount of spiking. Were the Swarovski SLC HD binoculars perfect, you'd never see glare with them from nearly-direct sun or sun reflected by water/snow/ice. The truth is that you can induce sun glare if you work hard enough at it. Perhaps, one day, glare will be a thing of the past for all binoculars. For the present, Swarovski comes as close to eliminating it as any optics we've seen. What about a Porro Prism-like Three-dimensional Effect? Because of the depth of view with the Swarovski SLC HD binoculars' optics, they come amazingly close to a Porro prism's three dimensional view. It's an enjoyable view and part of the SLC HD binocular experience. 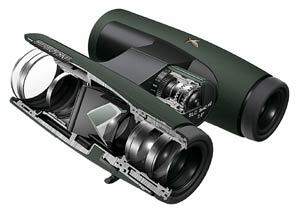 What Does Swarovski Include with the SLC HD Binoculars? The carrying case provided with the Swarovski SLC HD binoculars is stiff enough that the roomy interior provides good protection for the instrument as well as any minor additional items a person might wish to have ready at hand when using them. 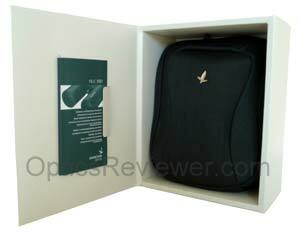 The case is padded and appears to provide good protection to them from the outside as well as providing a velour-like lining in the area where the binoculars ride to protect them from scratches within the case. In front of the binocular's area is a smaller pocket made with small mesh and elastic at the top that seems like it was made for a lens cleaning cloth. There's also a ripstop nylon pocket against the front of the case which we feature would be ideal for a thin document such as topographical map. You may even find room for a thin pair of gloves that would feel good during chilly autumn or winter weather when we often seem to find ourselves outdoors and using binoculars. There is a neck strap provided which attaches to the lugs on the sides of the Swarovski SLC HD binoculars and has a wide (about 1.6in/4cm), neoprene-like cushioned area to help soften the weight of the instrument on your neck. It adjusts quickly and easily for length depending on what you're doing on any given day. 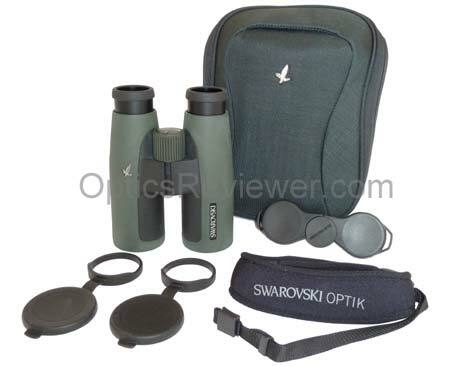 Swarovski provides a nylon belt with quick-release fasteners to use in carrying the case around your waist and independent of the binocular's neck strap. We like it and we've a hunch that many will find it a handy approach, but it's not likely something that everyone will adopt. The objective lens covers are made of what feels like a high-quality rubber that can be easily used in either cold or warm weather. They have rings that slip over the objective lens' end of the barrels and tether the caps to the barrels when not in use. Can they come off during vigorous activity? We think so and we're inclined to take them off if our activity is going to be such that we think we might lose them. A snapshot adapter which allows the binocular owner to perfectly align a digital camera with one barrel of the binocular included with the Swarovski SLC HD binoculars. We think it¹s a very clever device in its simplicity of design. It slides over one of the eyecups and can be pre-adjusted for the diameter of your camera's lens housing. You'll get a better understanding of it by watching the video - remembering that the snap shot adapter fits both the SLC HD binoculars and their siblings, the ELs. And, of course, a lens cleaning cloth is provided in the package. 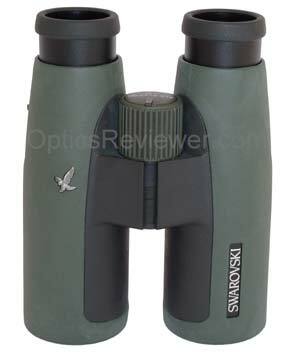 What's Our Recommendation Regarding Swarovski SLC HD Binoculars? If you talk with Swarovski staff about the Swarovski SLC HD binoculars you'll find that the 10X42 configuration is its most popular for the SLC and it's their most versatile one. We like the 8X42 a lot and feel that the extra brightness available with that configuration is worth quite a bit, but you'll get a terrific optical instrument with either configuration. We like it a lot and we'll be keeping this one for a while. When comparing the SLC HD to the EL with Swarovision, you'll find the Swarovision is better due to its field flattener lenses, but the SLC HD binoculars are pretty much the same except for that element. This former hunting binocular is now a favorite with binocular users everywhere. We know as well as anyone that it pays to shop! 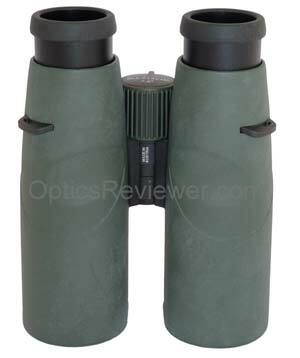 You can check the availability and pricing for the Swarovski SLC HD binoculars at Amazon.com (USA) and at Amazon.co.uk . For those of us for whom being able to see accurately at a distance makes a difference in our earning capacity and on-the-job recognition, this grade of optics qualifies as an investment in equipment which will likely enhance our professional reputations and earning capacities. If you're taking a trip with the goal of seeing wildlife, you'll want to ensure that you've optics that will allow you to get your money's worth from the trip. The SLC HD provides that grade of optics. The Swarovski SLC HD binoculars are covered by the company's limited lifetime warranty. If you'd like to know more about the Swarovski SLC HD binoculars' sibling with field flattener lenses, we've reviewed the EL with Swarovision, too.